As many Spanish people, I grew up in a household where feelings were sparingly shown and articulated. For many of us, all the ‘I love you’, ‘I’m so proud of you’ and heaps of hugs and making up belonged in the telly, and more specifically in the cheesy American TV shows from the 90s focused on family drama. In the last few years, I’ve noticed an increase in the use of the phrase ‘te quiero’ at the end of telephone conversations in Spanish TV shows, which I can’t help but think is a transfer from American culture. Little did I know while growing up in Spain that such behaviour does cross into real life, and what I wasn’t expecting at all was the way in which I would learn it: via a real American family. As is the case for many linguists, I am 50% of a cross-cultural couple, the other half was born and bred in the US. For over a decade now I’ve been observing our attitudes to emotions, but it wasn’t until a few weeks ago that I really got thinking about it. I attended a presentation entitled Communicating emotions in a foreign language, framed within the Language Acts and Worldmaking Debates series, in which Prof. Jean-Marc Dewaele talked about the research on multilingualism he’s been conducting for years. He focused mostly on two types of emotions: affection and anger, that is expressions of love and swear words, but I’m more interested in the former. So, how do speakers articulate love and affection in a foreign language as opposed to their mother tongue? How people express emotion in a foreign language is linked to factors like how and when they learned it (in a classroom vs immersion), and their own personality traits, but we can’t forget the influence of their mother tongue and, most importantly, the type of culture this is connected to: high- or low-context. 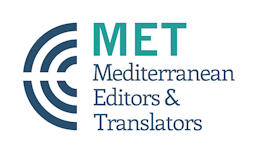 The US, for example, is a low-context culture where direct, explicit communication is favoured, while China – and to a lesser extent Spain – belong to the former group, with strong connections between group members and a preference for symbols and non-verbal cues. Basically, we know we love each other, so we don’t have to say it out loud. Many Spaniards will be familiar with this approach. This takes me to the crux of the matter: does this inherent feature of my culture prevent me from being more expressive in English or any of my other foreign languages? According to Prof. Dewaele, when we add a new language to our head, this may have an effect on our behaviour and on how we use our other languages. So to speak, I could be expressing emotions in Spanish in a way that is more typically English, or vice versa. I must say this doesn’t happen to me very often: I keep my Spanish cool and my English warm. However, the years I spent in the US, obviously speaking English, turned me into a hugger, which I wasn’t before. This is undoubtedly related to something he said: when we fall in love in a language, that becomes the vehicle for expressing our feelings. And this can shift throughout life, of course. I found this incredibly interesting, so I decided to dig deeper into my own experience and into some of Dewaele’s articles. I admit that, for me, being able to express my emotions in English is liberating: I know exactly what I’m feeling and what I’m saying, but I can still manage to distance myself slightly from the deep meaning of those words, which wouldn’t be possible in Spanish. This is apparently very common. And, according to Dewaele, this strategy of imposing distance or proximity between us and what we feel goes beyond love. It’s often seen in therapy after a trauma – talking to a psychologist in a foreign language might be a completely different experience than doing it in your own language. This goes so deep that the language in which we’re asked a question can determine the answer. 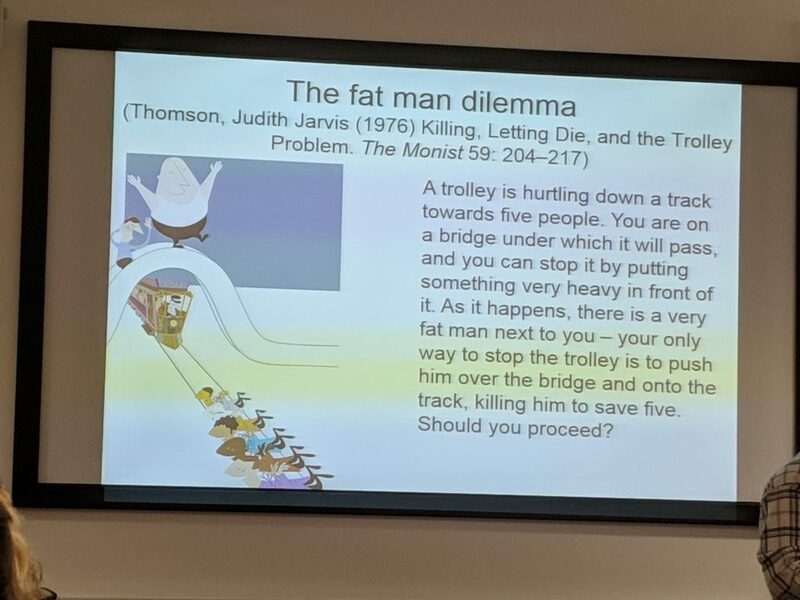 The fat man dilemma is a good way to explain it (see picture below). If you’re interested in this type of research, you can find some of Dewaele’s papers here. In the same article, I came across an idea that sounded familiar: negative reactions from outsiders in the face of a couple’s hybridity and ways of communication, and most importantly, how proud the couple is of “the dual and hybrid national identities they embrace.”* I gave some thought to this and realised that, in our case we aren’t limited to just our two cultures, but also to those of the other countries where we’ve lived or to other languages we’ve learned. It feels as though we had borrowed bits and pieces from each culture/language and glued them together to create this multicoloured quilt. It never gets boring! This talk triggered many questions! Do our feelings for another person develop more quickly if we come from a culture where emotions are overtly expressed or is it a question of personality? Is it very likely that the chosen language of communication in these couples changes throughout the relationship? Most mixed couples I’ve met agree that it’s close to impossible, and so does Prof. Dewaele. To what extent can acculturation change the deeply rooted patterns we grew up with? What about self-talk? Do our emotions at a given time determine the language in which we talk to ourselves? So many things to explore! Are you also part of a cross-cultural couple? What’s your take on all this? I’m interested to read your thoughts! *Dewaele, Jean-Marc. “Pragmatic Challenges In The Communication Of Emotions In Intercultural Couples”. Intercultural Pragmatics, vol 15, no. 1, 2018, pp. 29-55. Walter De Gruyter Gmbh, doi:10.1515/ip-2017-0029. Dewaele, Jean-Marc, and Lora Salomidou. 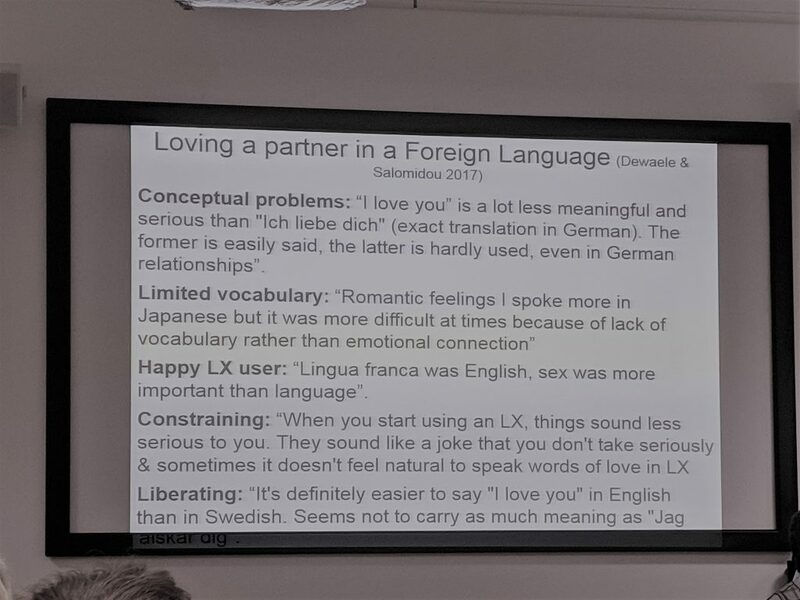 “Loving A Partner In A Foreign Language”. Journal Of Pragmatics, vol 108, 2017, pp. 116-130. Elsevier BV, doi:10.1016/j.pragma.2016.12.009. What an interesting article, as usual! I find it very interesting what you say about hugging and expressing affection, which I think is pretty recent to the British culture as well – I only became a hugger at uni, and my dad still recoils at seeing my brother hugging his friends! I also find expressing love verbally quite cringeworthy, but I think more and more Brits are adopting it. It’s interesting that Spanish culture is also closer to British culture in this regard, as we always stereotype Mediterranean cultures as very expressive. My husband is (British) Chinese and I am constantly learning new things about the culture. Only today he told me that hitting my chopsticks together is rude! It’s also interesting what you say about us being a product of the cultures around us – so my husband is much more comfortable with American culture because he has family there and grew up watching a lot of American TV. I, on the other hand, have always had a very wide circle of non-British friends, which has also shaped me. Thanks for sharing your experience, Fuschia. I find it surprising that the media, like TV and now social networks, can have such a deep influence on our behaviour. It’s amazing that your husband feels closer to American culture on account of TV shows, for example. As for Spanish culture being close to British culture, it depends. 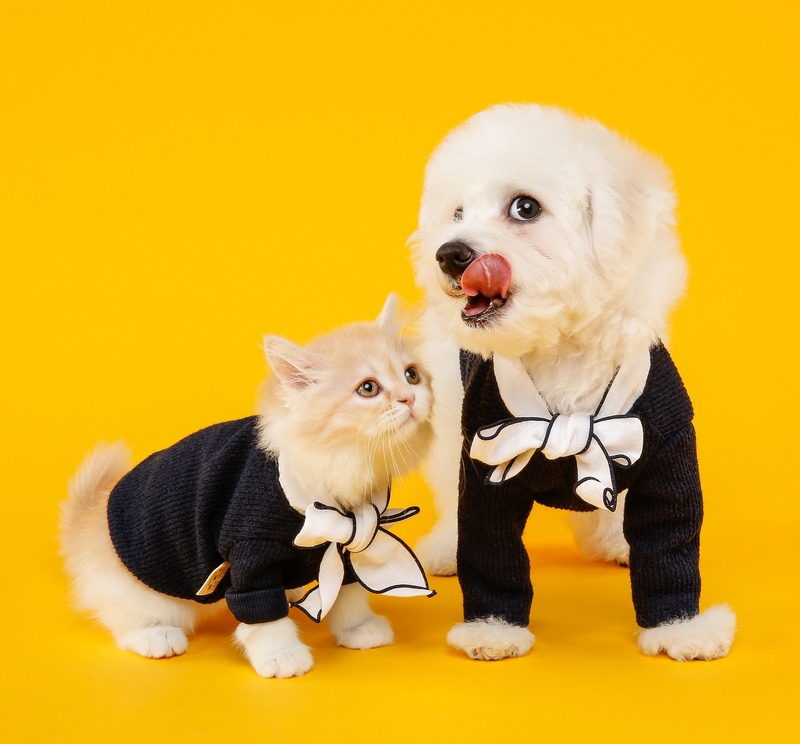 We’re more expressive and louder in general, but when it comes to affection in particular, I find we’re definitely subtler than Americans, for example.